As I have told you elsewhere on this site, I first experienced video movie photography in 1984. Whilst we were holidaying in The Gambia, a fellow guest at the hotel where we were staying, filmed Emily and I using his very large video camera with separate recorder -and played the image back for us to see in the viewfinder right there and then. At the time, that was miraculous! The only home made movies I had seen prior to that were on cine film, which had to be sent away for processing before they could be viewed – it took a week or so before you could actually see the images after the exposure of the film in the movie camera. When we returned home I set about learning all that I could about this new technology. There was no internet, of course, so the only way was to get hold of trade magazines from the major manufacturers – Sony, Panasonic, JVC etc etc – all big name Japanese companies. I also bought all of the back issues of the publication “What Video”, a monthly magazine which had embraced this new technology. It all made very interesting reading! It was almost like doing a crash course in a curriculum in the cutting edge of this technology, for which university or college courses had not yet been established. This subject was ‘right up my street’ (I must have been an early ‘geek’) as I had previously been employed in scientific laboratories where we used high tech’ apparatus to monitor quality control of production in factories where I was employed. It’s always the case that if the student is keen to learn a subject which he finds very interesting, then learning takes place at an unbelievably rapid pace. We decided to start the business “Memories On Video” with the intention of filming local events like weddings, christenings, sports occasions – all kinds of things! 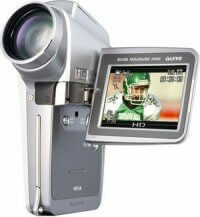 Domestic video camera recording at this time involved using a very large and cumbersome video camera which was connected by a lead to a separate portable video recorder. 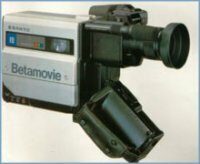 Panasonic and JVC had produced recorders using the VHS system, while Sony had produced a much superior system using their Betamax system. It was a very keen amateur video recordist who would carry this very bulky kit to film his holiday abroad! It did happen though! – as my experience in The Gambia proved at first hand! By the mid 1980s, Sony had produced their first “camcorder” – a term which was introduced by the trade to describe a unit which included both camera and recorder. The VHS people also introduced their camcorders. Both systems recorded on to full size domestic cassettes – Sony to Betamax and Panasonic/JVC to VHS. This, of course meant that the camcorders were necessarily very large machines and generally had to be ‘shoulder mounted’ affairs! Before long, the VHS people had introduced VHS(C) which was a ‘compact’ VHS cassette – enabling a much smaller camcorder to be developed. The smaller cassette was inserted into a ‘mother’ adaptor, which was the same dimensions as a full sized VHS tape and could be played in a standard VHS domestic recorder. In response, Sony introduced ‘Video 8’ which was a much smaller cassette enabling their camcorders to be the ‘smallest yet’ – though, by today’s standards, they were still quite bulky affairs. Improvements in picture and sound quality were achieved when the VHS makers introduced SVHS (Super VHS – an improved version of VHS giving sharper picture resolution). Still not to be outdone, Sony brought out their Hi8 format (as did others, who by now – late 1980s had entered the market place). 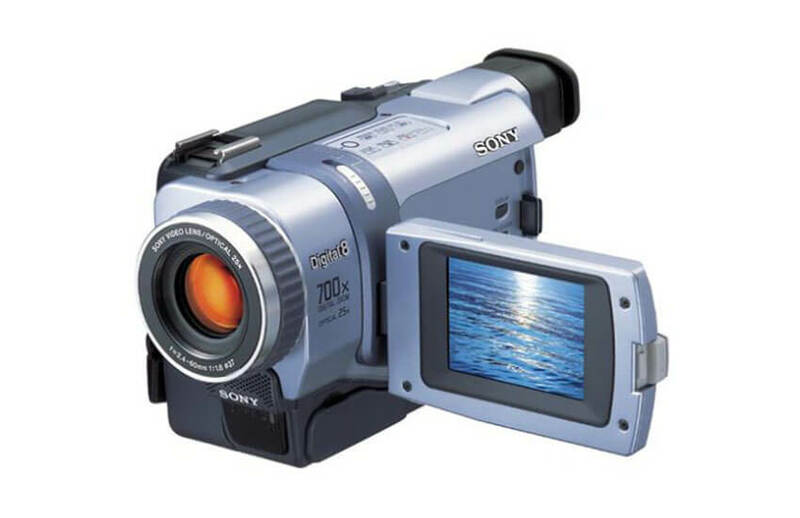 Things did not change again until 1995 when Sony dramatically changed the scenario by introducing MiniDV, a digital format which produced extremely high quality recordings. 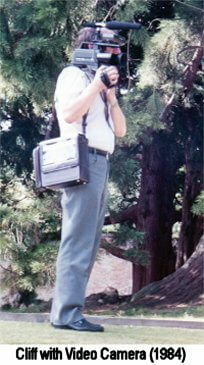 The tape was tiny and enabled much smaller camcorders to be brought into use. I bought a JVC one which fitted comfortably into my trouser pocket! – it was about the size of a pack of playing cards. All manufacturers embraced MiniDV, they had no alternative really, the 8mm camcorders looked like dinosaurs in the shop windows when put alongside the MiniDV ones. Amazingly, in 1999, Sony had a ‘last fling’ at the 8mm format by introducing “Digital 8” which had the same improved picture quality as the MiniDV tapes, but as the tape itself was still much larger, they were not able to produce a ‘pocket sized’ camcorder. The format was very short lived – was probably a disastrous experiment when looked at with the benefit of hindsight. With the arrival of the 21st Century, manufacturers were slowly introducing ‘tapeless’ camcorders. This was enabled by recording the digital signal directly to a ‘memory card’ (e.g SD card, memory stick.) Gone was the need for a bulky tape transport mechanism and for the bulky battery needed to power it! As I write this, I have a Sanyo Xacti Hi definition camcorder which is really tiny, it records to SD cards (I use SanDisk) and when viewed on a Hi Def screen, the picture quality is unbelievable!! My grandchildren all have very tiny “state of the art” mobile phones, which as you know, all have video recording ability included. I still find the technology exciting and amazing. I am reminded of this history every day -“copy my betamax to DVD” “Please transfer my VHS to DVD” “can you put my Hi8 on to Blu-ray yet?” “MiniDv tape to DVD disk” and many other requests. What of the future? Who knows? “They can’t get any smaller, can they?” – well, we used to say that when video 8 came along !!!!! !